How is Office 365 capturing the market? Microsoft's Office 365 has grown in popularity with new features and an expanding user base. In the fast paced digital world we inhabit, there are a million different programs and apps vying for our attention. In fact, our time is so taxed these days that the market for apps that help you organize your life, manage your business, and otherwise help you keep your head from falling from your shoulders is booming. Office 365 is a perfect example of a collection of cloud-based programs on offer to both the layperson and businesses, intent on helping people stave off chaos. It can be hard to whittle down just what program suits you and your business’s needs (that’s why handy sites like ITProPortal help with some of the heavy lifting), but Office 365 is looking to create further separation over the competition with every new iteration. The latest offering from Microsoft is on track to dominate the market as a number of new features and improvements make this one of the most popular and fastest growing program offerings out there. There are a lot of people using Office 365. I mean, a lot. Microsoft’s most recent earnings report from the end of January had revenue in productivity and business processes at $7.4 billion, up 10%. A big driver of that revenue was Office 365. Microsoft tallied 24.9 million total subscribers as of that last report, representing a huge number of people using Office 365 to help manage their businesses. And the commercial cloud annualized revenue run rate – which is calculated by taking revenue in the final month of the quarter and multiplying it by twelve for Office 365 commercial, Azure, Dynamics 365, and other cloud properties – exceeded $14.0 billion. These are some huge numbers that just go to show that Office 365 has not only thrived, but is looking like it is becoming the cloud-application offer of choice for businesses around the world. And Microsoft is making a pretty penny off of that development. Not to mention that revenue growth for Office 365 commercial is up 47%, and you have what looks like a strong indication that future sales will not disappoint. There’s even evidence to suggest that larger companies are looking to Office 365 to help out with some of the heavy lifting in the cloud. Whereas before the apps mainly catered to small- and medium-sized businesses, now that the bigger fish like what they see, they too might be willing to give the programs a shot. Concerns surrounding security, privacy and operation aspects – while all genuine reservations with any sort of cloud-based services – have begun to subside as more of the digital world is joining the cloud, forcing these companies to follow. Not to mention that companies operating in the cloud are putting increased emphasis on data protection, and that goes for Office 365 as well (more on that later). Add those larger fish to Microsoft’s already impressive 85 million monthly active users – set to surpass 100 million active users in early 2017 – and you have what might be the beginnings of an empire. It’s Selling . . . Great. So What? Numbers are all well and good, but just because sales are strong, doesn’t necessarily ensure that the product is top flight. After all, the Furby toy boom took a while to run its course before people realized they were shelling out hard-earned cash for horrifyingly ugly fuzzy-dolls. But I digress. 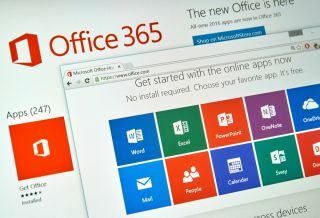 Office 365 is not resting on its laurels as it seeks to continue capturing more and more of the cloud services market. As mentioned before, cloud services often carry with them the added risk of putting your information in harm’s way by virtue of always been tethered to the internet. Being constantly connected is great, but that means being eternally vulnerable to breaches. But this February, Microsoft sought to kill off some of those worries with a new rollout of security features for Office 365. These new features include Office 365 Secure Score which, as the name implies, provides a score to the user’s current office 365 configuration by way of a new security analytics tool. Another addition to the could-based service is the Office 365 Threat Intelligence. This new creation will leverage billions of data points from the Microsoft Intelligent Security Graph to provide information on online threats. This particular offering is currently in private preview with general availability slated for later this year. A final new security addition is the Office 365 Advanced Data Governance, which hopes to employ machine learning in the defence of its customers’ data. This program will use machine learning to help users find and retain meaningful data while eliminated non-essential pieces of information that could be at risk if compromised. Similar to the threat intelligence program, advanced data governance is in private preview until its expected general release later this year. And that’s just the security end of things. Microsoft is targeting the popular work chat app Slack with its own creation through Office 365 Microsoft Teams. The company also released developer tools to allow its millions of monthly active users to get in and toy around with software integrations ideas of their own to add on to Microsoft teams. There’s talk of bots that can surface in chat channels and serve as a proxies for queries and quick actions by the customer. Looks like Microsoft is going all in on the robotic revaluation/digital singularity. As it stands, Microsoft has said that 30,000 organizations have actively started using Microsoft Teams, across 145 markets and 19 languages. While that may not be enough to dethrone the very popular (and very hip) Slack, the move shows that Office 365 is not remaining stagnant. Office 365 has a tonne of things going in its favour. Besides all the stellar growth numbers and the expanding scope of its cloud-based services, the suite has a number of other offerings that we didn’t even touch upon in this article, like Skype services and the ever popular OneDrive cloud-based storage. The strong numbers and interesting features coupled with legacy applications towing strong reputations, and it’s easy to understand why Office 365 is gobbling up the market. This doesn’t necessarily mean that Microsoft will own the cloud-based services sector in the long-term, but it does point towards a strong brand only growing stronger, and nurturing an ever-growing audience along the way.